If you are a marketing professional and have a hard time selling yourself to recruiters, then don’t despair, because you are not alone. Many marketers struggle to come up with a good CV, despite the irony of spending their professional lives creating eye-catching ads and alluring branding campaigns. Even if you don't initially realise it, though, job searches have a lot to do with marketing and the better you promote yourself through your CV, the greater the chance you have of landing a job. Since images speak louder than words, we have gathered a few marketing CV template examples that you can use to help in your digital marketing job hunt. Using a template is an excellent idea if you are just starting out and don’t want to start the work from scratch. But, if you want it to beat the applicant tracking system and get it into recruiters’ hands, you need to make sure that it’s tailored to the specific vacancy. The best way to achive this is by ensuring that you use relevant keywords. If you are just starting out, then it's probably a good idea to use an entry level CV, like the one in this example. It shows that the candidate doesn’t have much experience in the field and, therefore, focuses mainly on education. The career objective section plays a vital role, too, because it gives a brief summary of who this person is by stating their key attributes and career goals. Alternatively, it could be expanded to two pages, focusing mainly on key skills and providing examples of how they have been met. You can use this CV template if you are applying for an internship. It shows that, actually, you don’t need that much information to create a CV, as long as it includes what is important to employers. It’s shorter and much more concise than the previous one, but contains important details about the candidate's work experience. It also invites employers to check out his work through his portfolio and social media profiles. If you want to work as a content writer, then this is the CV for you. Technical skills are more important than education in this example, because it’s important to show clearly what the candidate can do. It is an accomplishment-based CV, and every role is backed up with quantified results. Social media management is a relatively new (albeit in-demand) marketing profession; nevertheless, there are many example CVs to take inspiration from. This one from CareerOne shows what kind of skills the candidate has, as well as a quantifiable track record of the way he has performed in his previous roles. He also gives a clear indication of his technical skills, which are important in a position such as this. Instead of a reference section, this example includes LinkedIn endorsements from professionals who have previously worked with this candidate; an interesting approach that certainly demonstrates creativity. It also lists education and professional development last, although this doesn’t matter because, in this example, work experience is more important. Any managerial level CV needs to include key areas of expertise, professional experience and accomplishments. This example gives out sufficient information on each position, showing what this candidate has done in previous roles. The professional profile at the top of the page also fits perfectly here, working as an excellent introduction to the candidate. 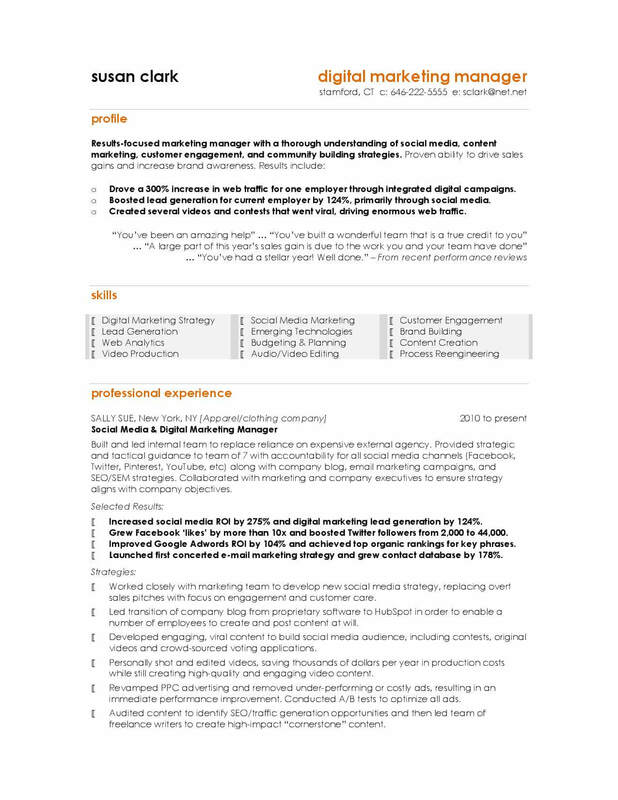 This CV template is perfect if you are applying for a digital marketing manager position. It focuses on key skills and experience and provides evidence of prior achievements. For instance, the career summary says ‘results-focused’ and in the same section, it justifies that statement with examples of the candidate's contribution. It also highlights the main points that the candidate wants the recruiter to see. Focusing on skills, achievements and awards, this template is effective because it shows what the candidate has done in the past, and gives employers a clear idea of what he can do for them. You can also make your CV achievements-based, by showing how you overcame a specific problem, situation or challenge (Problem, Action and Result). Also, be sure to include some figures to make it more convincing, while you should also ensure you are specific when you talk about dates and job duties. This CV template gives priority to the professional summary, qualifications, skills and experience of the candidate. If you are applying for this position, you need to talk about the skills you possess that are directly applicable to the job. As an email marketing manager, you will need to possess excellent writing, editing and proofreading skills to be able to check the accuracy and quality of information provided in emails, as well as leadership to oversee the smooth running of email marketing campaigns. These skills should be on your CV backed up by relevant examples where necessary. Focusing on the key skills and competencies that a market research analyst should have, this example is brief, but still includes all the information employers expect to see. The personal summary clearly states the candidate's career objectives, while the work experience section gives recruiters a clear idea of what they have done in the past. These template examples can give you a few ideas on how to create your CV, although if you're still struggling and feel like you need the guiding hand of a professional, then be sure to check out our handy CV writing service! After all, recruiters expect high-quality self promotion from a marketing job candidate, so you can't take any chances. Finally, always remember that job search success is not defined by how many CVs you send out, but rather the quality of each individual CV and how relevant it is to the job at hand. Are you a digital marketer? Do you have any other CV tips? Let us know in the comments below!